In which G.M. Norton is the last man standing and needs your vote. Awards, awards, awards. Lately, dear readers, that is all I have been hearing (apart from the little voice in my head – who sounds remarkably like Sir Noël Coward – that repeatedly encourages me to do the most caddish of things). Last weekend my beloved and I travelled from our home in Manchester down to Londinium. The reason? Well, two in fact. One was a little meeting with a film director and the other was the small matter of a UK Blog Awards ceremony where this very periodical was challenging for the ‘Most Innovative’ crown. Alas, Norton of Morton ultimately failed to scoop the gong. As one of the judges was a former Sun journalist, perhaps it’s for the best. The winner of ‘Most Innovative’ was the splendidly named The OCD Squirrel. Having read the other blog finalist efforts, The OCD Squirrel and Never Ending List were my pick of the bunch so a hearty congratulations to Miss Annie Squirrel. What I particularly enjoyed about The OCD Squirrel was the randomness. As you will know by now, your favourite protagonist rather enjoys randomness. 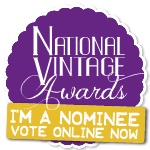 Moving on slightly, Norton of Morton is now on the shortlist for Best Vintage Fashion/Lifestyle Blog in the National Vintage Awards. Other challengers include the rather formidable (and fabulous) Retro Chick, along with The Forties Floozy and Mancunian Vintage. Out of the nine blogs, sadly I am the ONLY man. I’m not sure why but it appears that menfolk are an endangered species in the vintage blogosphere. Of course, there is the wonderful Bruce off of Eclectic Ephemera, along with Mat from Tales of a Southern Retro and Lars from the Danish Chap's Attire Chronicles who recently featured in my dandy feature. I do so wish there were more chaps penning their own electronic journals. I find that ladies love to read about what fellows get up to. If you’re rather fond of this periodical, I would be ever so pleased if you could lend me your vote. 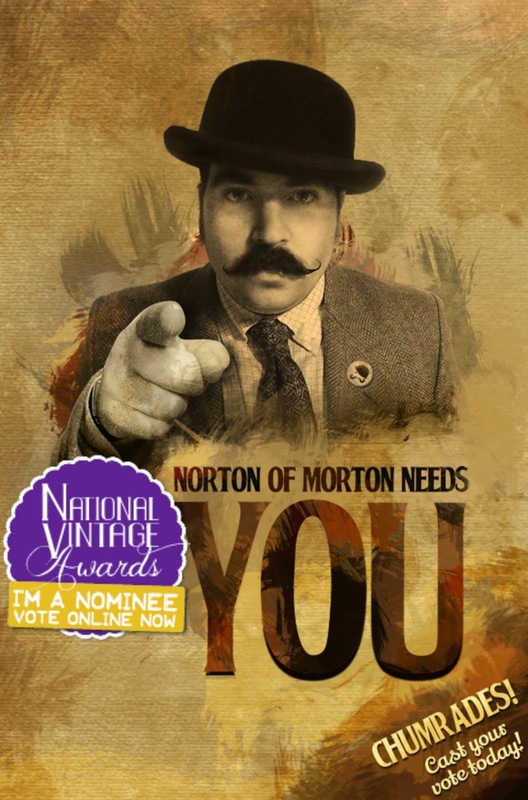 Simply click on 'Norton of Morton', then enter your email address to confirm the vote. Easy as pie. You have until 31st May, so please don’t delay. Remember, a vote for Norton of Morton is a vote for men with old-fashioned values. Quite frankly, I'm a good one hundred votes away from the leading blog so I need all the help I can muster! Thanks awfully for stopping by, Miss Squirrel (and for your vote)! The awards ceremony was certainly packed with people. Perhaps our paths will cross again in the future!